(Newser) – The world's nights are getting alarmingly brighter—bad news for all sorts of creatures, humans included. 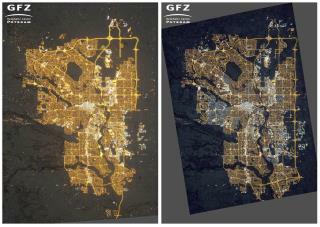 A German-led team of researchers says light pollution is threatening darkness almost everywhere, the AP reports. Satellite observations during five Octobers show Earth's artificially lit outdoor area grew by 2% a year from 2012 to 2016. So did nighttime brightness. Light pollution is actually worse than that, according to the researchers. Their measurements coincide with the outdoor switch to energy-efficient and cost-saving light-emitting diodes, or LEDs. Because the imaging sensor on the polar-orbiting weather satellite can't detect the LED-generated color blue, some light is missed. Except in the hearts of men. The next plan is dealing with noise pollution. All of you with dumb a** loud mufflers need to tune down -- both manufacturers and consumers. Disruptive traffic noise is not sporty. It is difficult to escape brightness even with dark drapes. When I first moved to my house, in bed at night you couldn't see your hand in front of your face. Then a neighbor across the street installed mercury lights, I guess for security, and now the street is like the expressway. No escaping it. I do remember some decades back when we had an energy crisis and everywhere wasn't a lit up as now. Criminals are not the only ones who love the dark.